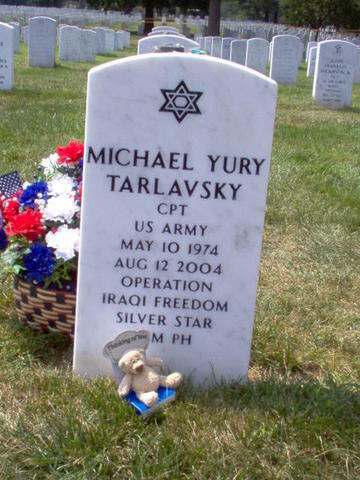 Captain Michael Yury Tarlavsky, 30, of Passaic, New Jersey, died August 12, 2004, in Najaf, Iraq, when his unit came under small arms fire and grenade attack. Tarlavsky was assigned to 1st Battalion, 5th Special Forces Group, from Fort Campbell, Kentucky. For further information related to this release, please contact Army Public Affairs at (703) 692-2000. At the age of 3, when Michael Yury Tarlavsky refused to eat his dinner, his grandmother knew just how to change the stubborn boy's mind. "The only way to be a soldier is you have to eat to be big and strong," she said, according to Tarlavsky's younger sister Elina. This worked like a charm for the young Tarlavsky, who even as a child, had his sights set on joining the military one day. Tarlavsky's dream came true when he enlisted in the U.S. Army after graduating from Rutgers University in 1996. He rose to become a Captain in the Special Forces and was shipped to Iraq last year. The 30-year-old former Clifton resident was killed Thursday in the city of Najaf. 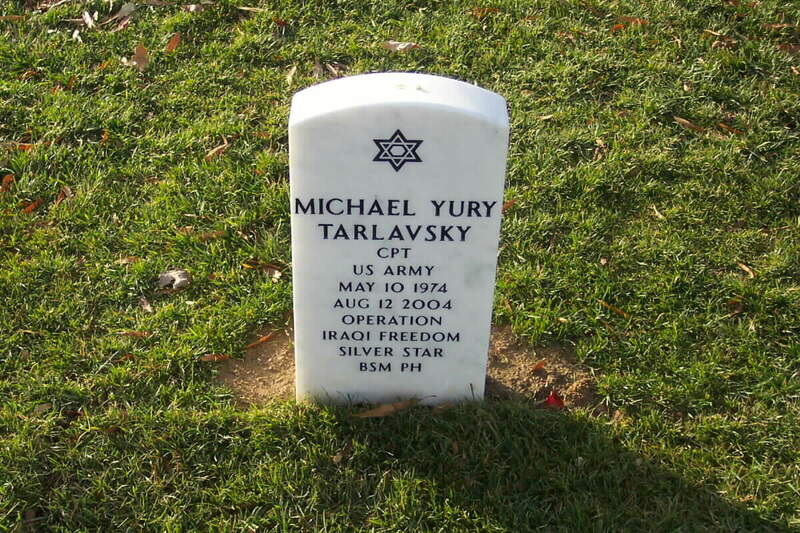 Tarlavsky is the 32nd soldier with New Jersey ties to die in the war in Iraq. The Department of Defense said Tarlavsky's unit, the 1st Battalion, 5th Special Forces Group, came under small arms fire and a grenade attack. Tarlavsky was married and the father of a 10-month-old boy, Joseph Michael, who lives in Clarkesville, Tennessee, near the Fort Campbell, Kentucky, military base. News of his death was so devastating that Elina Tarlavsky, 29, could not bear to break the news to her parents, immigrants from the former Soviet Union. So she let the casualty officers deliver the news. "Why did it have to happen to him?" asked Elina Tarlavsky, sitting in her father's Passaic apartment yesterday afternoon. A Yartzeit memorial candle, lit in accordance with Jewish customs of mourning, and a shot glass filled to the rim with vodka ringed a photograph of Tarlavsky dressed in uniform, propped on a coffee table. A shot of vodka is a Russian way of honoring soldiers who have been killed, said Tarlavsky's father, Yury, who was a merchant marine in the Soviet Union. "It's difficult," said Yury Tarlavsky, 67, shaking his head slowly. "He died for oil." Tarlavsky was born in the Republic of Latvia, a part of the former Soviet Union. His family moved to the United States in 1979 when he was 5, settling first in New Orleans. They moved to Clifton in July 1986, when the economy took a downturn in Louisiana and Tarlavsky's mother lost her job. Tarlavsky was an active child who always wanted to join the Army. "The Army should give me something because he got all his training from me," said Elina Tarlavsky, recalling numerous tussles that she had with her only sibling. Tarlavsky graduated from Clifton High School where he was captain of the swim team. He attended Rutgers on a ROTC scholarship, graduating with a degree in exercise science. He wanted to be a physical therapist one day, Elina Tarlavsky said. In February 2002, Tarlavsky married his wife, Tricia, an Army Captain he met while visiting Hawaii. She shared his passion for running marathons, scuba diving and rock climbing. The couple settled in Tennessee. Shortly after the marriage, he was shipped off to Afghanistan. In early 2003, he was deployed to Iraq for five months. When he returned home, he delivered his first and only son in a Kentucky hospital on September 23, 2003, with help from a doctor. "There was a doctor right over his shoulder," said Elina Tarlavsky. "He wanted the full experience." Tarlavsky was shipped back to Iraq in July. The last time she heard from her brother was Wednesday night when he sent her a belated birthday greeting through instant messaging. "How are you," she wrote back to him. "As good as to be expected," he replied. Tarlavsky was killed just hours later. Funeral arrangements have not been made yet, but Elina Tarlavsky said her brother wanted to be buried in Arlington National Cemetery. "He did his job very good," said Yury Tarlavsky. "I'm very proud of my boy for what he did for his country." 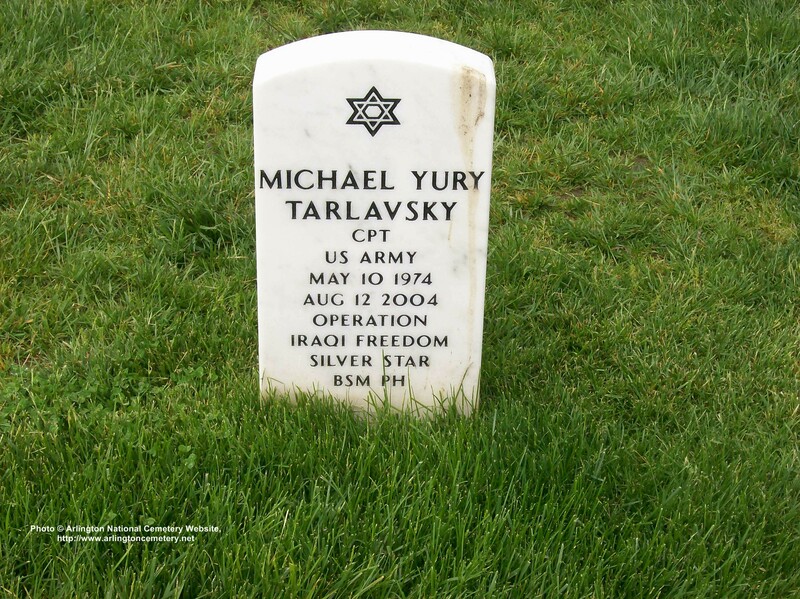 Army Captain Michael Tarlavsky was 5-foot-7 and all muscle, a gentle, driven, bulldog of a man. He wanted to become an Eagle Scout before he was 18, and he did. He wanted to be a star swimmer in high school, and he was. By the time he was 30, he had mastered rappelling, scuba diving and triathlons -- and become a husband, father and a member of the elite Special Forces. He was, a longtime friend said, "like Superman." Friends and family said that record of triumph made Tarlavsky's death in Iraq on Aug. 12 especially shocking. 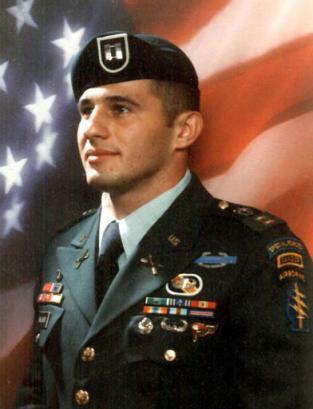 Tarlavsky, of Passaic, New Jersey, was killed when his unit came under small-arms fire and grenade attack in Najaf. He was 30. "He's always been a survivor; he'd always succeed," said childhood friend Lenny Santiago, 28, of Daytona Beach, Florida. "I would never expect this to happen to him." Yesterday, family and friends gathered in the still, thick heat at Arlington National Cemetery as the career soldier was laid to rest. Among them were Tarlavsky's wife of two years, Tricia, and their golden-haired son, Joseph Michael, 11 months old. Tarlavsky would have no regrets, said his sister, Elina Tarlavsky, 29. Though he was born in Latvia, he embraced the United States when the family immigrated here in 1974 and he had long wanted to be a soldier, she said. During the Persian Gulf War, she said, Tarlavsky was unhappy that he was too young to enlist. "He always said he couldn't be president because he wasn't born here, but he could be a five-star general," she said. An adrenaline junkie and avid outdoorsman, Tarlavsky loved the military for its adventure and challenge, said Matt Pellettere, 31, of Paterson, New Jersey, who met Tarlavsky and Santiago in the Boy Scouts. "Michael was always gung-ho," he said. Tarlavsky attended Rutgers University on an ROTC scholarship and joined the National Guard to help pay for school, Elina Tarlavsky said. He graduated in 1996 with a degree in exercise science. Since receiving his commission, he had completed tours in Korea, Hawaii, Afghanistan and Iraq. Tarlavsky, a member of the 1st Battalion of the 5th Special Forces Group at Fort Campbell, Kentucky, was deployed to Iraq for a second time in July, she said. 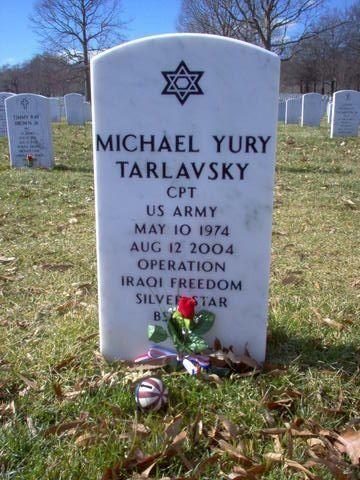 Tarlavsky had received several medals, including the Bronze Star. He was awarded a Purple Heart posthumously. He met his future wife in February 2001 while visiting Hawaii, where she was serving in the Army. Though separated by oceans and continents, the two courted while Tarlavsky completed training in North Carolina and a tour in Afghanistan. A year after they met, Tarlavsky called friends and family from Hawaii to invite them to a beach wedding -- four days later. Tarlavsky was elated when Joseph Michael was born in late 2003, and he could not wait to scale mountains with his son, friends and family said. When he was deployed last month, Elina Tarlavsky said, he was eager, as usual, to fulfill his mission. But "this time was different . . . because Joey was here," she said. The night before he was killed, Tarlavsky and his sister instant-messaged each other. He told her that he was "as safe as could be expected." 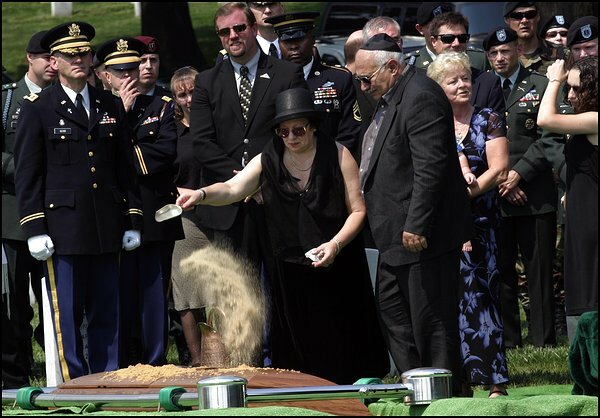 Yesterday, Tricia Tarlavsky sat under a cloudless sky with Tarlavsky's parents, Yury and Rimma Tarlavsky, as Rabbi Stanley Skolnik of Beth Shalom Reform Temple in Clifton, N.J., exhorted the soldier to "go your way, and may God be with you." Tricia Tarlavsky wiped away tears as the forlorn melody of taps echoed across the cemetery. Later, when she was presented with the folded U.S. flag, she clutched it close and caressed it softly.